Video by Allison Perry and Kody Kiser, UKPR and Marketing. LEXINGTON, Ky. (Aug. 2, 2016) – UK HealthCare’s University of Kentucky Albert B. Chandler Hospital is No. 1 in Kentucky in the U.S. News & World Report's Best Hospitals Rankings released today. It also is the only hospital in the state rated as High Performing in cancer. The complete rankings for 2016-17 are now available at http://health.usnews.com/best-hospitals. 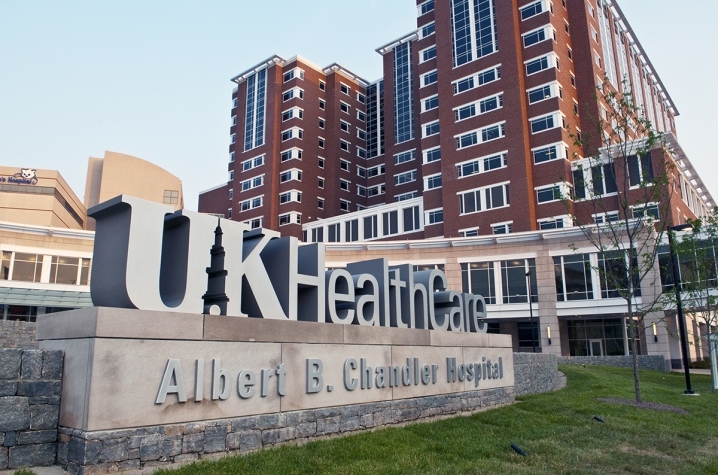 In addition to being named as top hospital in Kentucky, UK HealthCare is nationally ranked No. 45 in Geriatrics and "High Performing" in six specialty areas including: Cancer, Diabetes and Endocrinology, Nephrology, Neurology and Neurosurgery, Orthopedics and Pulmonology. UK HealthCare also ranked as high performing – the highest rating – in eight out of nine types of Common Adult Procedures and Conditions including: Heart Bypass Surgery, Heart Failure, Abdominal Aortic Aneurysm, Colon Cancer Surgery, Chronic Obstructive Pulmonary Disease (COPD), Hip Replacement, Knee Replacement and Lung Cancer. "This acknowledges the exemplary work of our health care team in providing the highest quality patient care in the Commonwealth," said Dr. Michael Karpf, UK executive vice president for health affairs. "We are committed to being one of the premier academic medical centers in the country and dedicated in serving those who need complex medical care without ever having to travel far from their home." To be recognized as a Best Hospital this year, a hospital had to have been categorized in the American Hospital Association annual survey database as a general medical-surgical hospital and had to earn either at least one national ranking in the 12 data-driven specialties or at least four ratings of "high performing" across the 12 specialty rankings and nine rated procedures and conditions. The U.S. News Best Hospitals analysis includes multiple clinical specialties, procedures and conditions. Scores are based on a variety of patient outcome and care-related factors, such as patient safety and nurse staffing. In February 2016, UK HealthCare achieved Magnet Status – the highest institutional honor awarded for nursing excellence from the American Nurses Credentialing Center's (ANCC) Magnet Recognition Program. This designation factors into the U.S. News Rankings and impacted this year’s score. UK HealthCare has seen the number of patients who are 75 or older nearly double in the past 10 years. This volume and the level of care for these patients attributed to the national ranking in geriatrics. Additionally, the University of Kentucky and UK HealthCare are home to the only National Institute on Aging (NIA) funded Alzheimer's disease center in Kentucky with the prestigious UK Sanders-Brown Center on Aging, and Markey Cancer Center is the only National Cancer Institute-designated center in the Commonwealth.